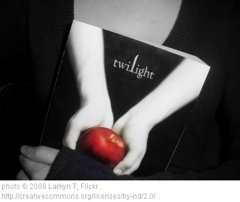 Just the other day–in a top 10 list–I mockingly bemoaned the fact that I couldn’t trade in my Twilight books at a local used book shop. more, it means we’re reaching market saturation. In essence, they heyday of the angsty teen vampire romance genre is on the way to its nadir. (Besides, it you desire to read a vampire story, go with Bram Stoker’s original, Dracula–an epistolary novel couched in terms of spiritual warfare. Accept no Stephanie Meyer, er, substitutes). Twilight, nor its sequels. But, you ask, why did you have them to trade in.